Technology has evolved immensely, over the past few decades. Even tractor sprinklers aren’t excluded from this evolution and have seen leaps and bounds from the place that they started at. While newer technology might be more complex, some will argue that the more complex a piece of technology is, the chances of it breaking down or encountering some form of flaw are greater. For that reason, many people opt to take older technology over newer pieces. This is certainly the case with the RainCoach Self-Propelled Traveling Sprinkler. It’s older, larger, and more expensive. There’s a lot more to it than just those things, however. We’re here lay down all the facts surrounding the RainCoach Self Propelled Traveling Sprinkler. We won’t sugarcoat them either – we’ll start with the things that make it great then we’ll get into some noticeable flaws. Finally, we’ll let you know if we think it’s worth the purchase! Keep reading for all the information you could ever want to know about the RainCoach Self-Propelled Traveling Sprinkler. While it’s certainly a different type of walking sprinkler than what we’re used to, let’s take a like at all of its positive attributes, attributes that really help it stand out from other types of tractor sprinklers! Excellent Spray Radius – The RainCoach is a grandiose traveling sprinkler, so much so that it can easily cover a wide spray radius without an issue. This is due to the excellent wingspan of its arms, which extend to a total wingspan of four feet, nine inches. Powerful – Similar to what we just talked about, you’ll be pleased to know that the RainCoach traveling sprinkler is powerful as well as explosive; It can pump out water at a staggering 75 PSI at a rate of 22.4 Gallons/minute. Imagine if you had this for your front lawn. You wouldn’t have to water it for weeks! 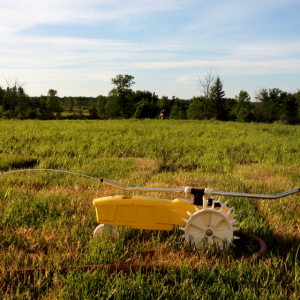 Excellent for Large Fields – This self-propelled sprinkler is built for large fields, such as those found on a farm or those found at a sports complex of a school, for example. While you can certainly set this up in your front yard, we wouldn’t recommend doing so; the amount of water it pumps out will radically increase your water bill. Built-in Shutoff Valve – Think about what it would be like taking this tractor sprinkler out on the field with you, and having to walk all the way back to where you started from just to turn it off. Thankfully, you won’t have to do anything like this with the RainCoach! It’s equipped with a built-in shutoff valve to stop the flow of water whenever you’re finished. Don’t worry about running across the field just to shut the water off! Nozzle Variation – It’s larger than most other self-propelled tractor sprinklers, so you’ll have access to a wide variety of nozzle connections and attachments. This is an excellent feature for those who need to adjust the overall pressure of the self-propelled tractor sprinkler based on the current state of the field or sports pitch they’re about to water. Durable – It’ll tower above any other tractor sprinklers that dare get in its way; its tall stainless-steel body is sure to last you and your company for years to come. After all, you’re going to want durability for the price you’re going to have to pay for this sprinkler. Warranty – It’s expensive, but it comes with a 5-year warranty. Don’t worry about any damages that may occur before or when you have it – the warranty is complete, with no limitations to it whatsoever! Heavy – Weighing in at 56 pounds, this tractor sprinkler isn’t easy to store or carry. Due to the awkward shape of its body as well, it can be tough to move from place to place, unless you have it on the field. While this probably won’t be used by anyone but grounds maintenance personnel or similar types of workers, it can be tough to repeatedly use for personal use. Definitely make sure that you have space and the ability to store this large sprinkler before you go all out and make the purchase. Water Consumption – Since it spits out many gallons per minute, you’re not going to want to use this on your lawn unless you can actually afford to do so. The RainCoach Self-Propelled Traveling Sprinkler is an excellent choice of sprinkler to have at your disposal, especially if you’re part of a maintenance team or a school athletic program. It can handle large amounts of area and drench the field in many gallons of water a minute. It’s quite durable as well and it’s made from materials that guarantee its survival for many years of repeated use. If you’re looking to purchase this tractor sprinkler outside of a professional setting, however, it can be quite costly. In addition to its price, the amount of water it uses can be incredibly taxing on your home’s water bill. It’s also quite heavy, making personal use and storage a difficult task. All in all, we’d recommend this tractor sprinkler if you’re looking for a powerful, sturdy, and long-lasting sprinkler for a field or farm. Outside of that, we’d say it’s not worth the expense!